Have you ever heard about brainwave entrainment? Well, today you’ll have a chance to discover this technology and, maybe, even meditate a little bit thanks to our guest -- Karen Newell. Being a store owner in a search of new business opportunities, Karen has used Cart2Cart to perform Modular Merchant to Shopify migration not so long ago. Now she’s willing to share her experience of utilizing our service, tell the story behind her entrepreneurship, as well as give several pieces of advice to you, our dear readers. Q: Hello Karen, thank you for being here with us! Let’s get to know each other. What other activities are you engaged in expect of entrepreneurship? I have been interested in expanded states of consciousness for many years but always found finding that still point inside very difficult to achieve. Intellectually, I understood the value of meditation, but I was too restless and impatient to practice. Eventually, I discovered brainwave entrainment technology and found that listening to such recordings could assist in attaining peaceful states of awareness. Regular listening allowed me to become more relaxed and to know myself in a way I hadn't before. I learned how so much could be accomplished by using intention in combination with such recordings. Along with developing Sacred Acoustics products and managing the store, I regularly teach throughout the U.S. and abroad with Dr. Eben Alexander, author of Proof of Heaven: A Neurosurgeon's Journey Into the Afterlife. 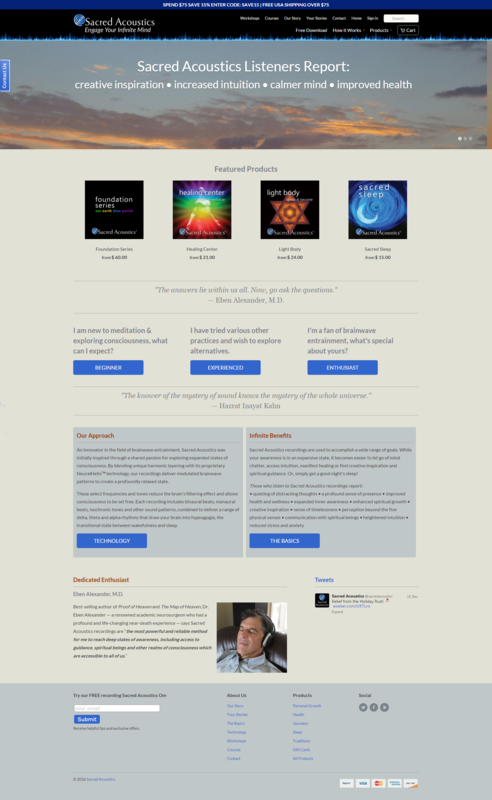 Together, we teach others how to use Sacred Acoustics recordings to explore within their own consciousness in order to find out more about our existence beyond the here and now. Q: So, you’re an owner of “Sacred Acoustics” store selling meditative recordings. We’ve listened to a free sample and we must say that’s pretty amazing 🙂 What’s the secret? Where do you get all those recordings? And how did you come up with an idea of opening an e-store? I work with my business partner, who is an audio engineer and composer, to create our one-of-a-kind recordings. They are produced using digital frequencies designed to assist the listener to reach expanded states of awareness more quickly than other forms of meditation using a technology known as brainwave entrainment, including binaural beats and other sound effects. Through a process of trial and error, we find just the right formulas and combinations of frequency to achieve the desired state, each recording is a unique creation. Listeners report profound relaxed states, fewer distracting thoughts, creative inspiration and many more benefits. We have also designed recordings to help people sleep better. We have been creating such audio recordings for others since 2012. Our first products were digital files that could be downloaded so it was naturally a good option to create an e-store for distribution. We are unable to offer our recordings on iTunes or other services because they require MP3 compression to keep the files small and this removes the critical frequencies needed for the strongest effects. Our recordings were so successful, that customers began requesting CD format. We needed a commerce solution that could handle both virtual and physical products and Shopify has been a great choice. Q: You’ve set a $75 free shipping threshold in your store. That’s a smart move. Basing on your observations, does it help to increase an average order value? Yes, free shipping has been a good incentive for customers and it has increased average order value. I chose the $75 threshold based on our product prices in order to encourage customers to purchase more items while saving money. I end up paying for the shipping but make a higher profit and my customers save money. It's a win-win situation. 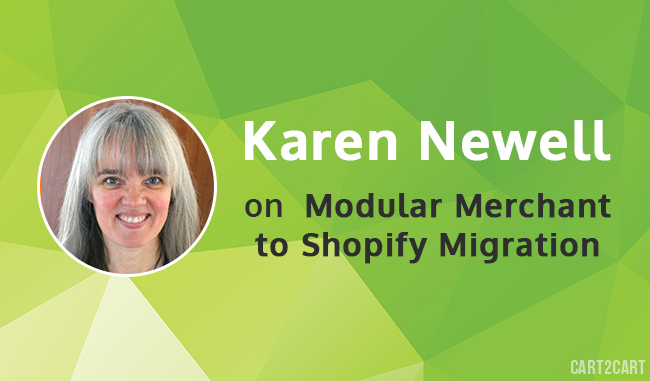 Q: Karen, you’ve recently used Cart2Cart to perform an automated Modular Merchant to Shopify migration. What has caused you to do so? Were you dissatisfied with your old solution? I found my old system to be limiting in several ways. It was a robust solution in the earlier days of internet technology, but so much has changed and they just didn't keep up. 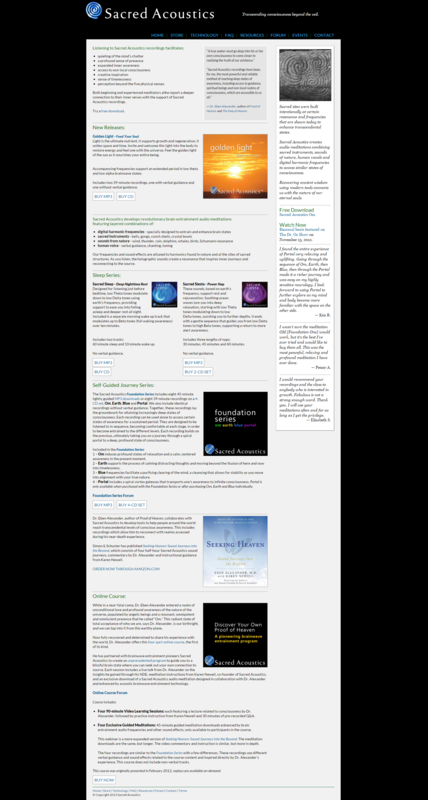 Templates were flat HTML files that had to be individually modified just to make one change in the navigation, for example. Customers regularly reported a blank page that would come up when placing an order and the technical support team just couldn't figure out what was going on. I just don't know how many orders I may have lost. The last straw was getting charged outrageous unexpected bandwidth fees. I had looked at Shopify several years earlier but it wasn't quite able to manage my need for offering downloadable MP3 files along with CDs that need to be shipped. When I checked again, Shopify was able to manage nearly all of my needs. Q: What’s your impression of Cart2Cart? Were there any troubles you’ve encountered during the data migration? When I first considered how to convert my data to the new system, I thought it would be impossible. I heard about Cart2Cart from a Shopify forum and saw they had many automated system-to-system options, but not mine. I asked about a custom migration and thankfully was informed that yes, they could do it, and for a very reasonable fee. My contact at Cart2Cart was very responsive, patient and helpful and I could tell she had a dedicated team working behind the scenes. I have converted data myself in the past and knew firsthand how challenging it could be to get it right. There was a lot of trouble in matching up the old data fields with the more modern system. During a two-week period, there were many attempts at importing the data that just didn't look right and I was ready to make compromises in order to get it finished. But Cart2Cart did not compromise, they kept at it until all my international and U.S. customer addresses were showing up properly, along with the exact products ordered and the date of purchase. This allowed me to focus on other aspects of launching the new site without having to worry about the data. They completed the conversion exactly on time for my store launch. Q: Now, when the migration is successfully finished, how does it feel running your business on Shopify? What improvements have you noticed? Shopify is a much easier platform to work with, especially the amazing templates that are optimized for mobile devices by default. I was expecting to have to refer to spreadsheets with thousands of lines of data in order to determine customer order history. But thanks to Cart2Cart, I am especially thrilled to have 3 years of customer and order data from my old system show up within Shopify, just like current orders. I can see exactly what and when my customers ordered in the past and this has been an invaluable part of the process to keep my ecommerce system running smoothly. Cart2Cart Team is infinitely thankful Karen for time and efforts she spent to share her migration experience using Cart2Cart service. We wish Karen many delighted customers, inspiration and a success in expanding the borders of her consciousness further on!